Afghan president Hamid Karzai speaks during a meeting with unseen U.S. senator John Kerry on August 20, 2010. The units will be aided by the U.S.
(CNN) -- Afghan President Hamid Karzai is expected to announce Monday a plan for two special anti-corruption units -- set up with U.S. help and participation -- to operate without government interference. U.S. Sen. John Kerry, who met with Karzai last week, said the Afghan president told him he supported the work of the anti-corruption units and would let them work unimpeded. "For the first time, the president has publicly committed to proceeding forward with the major crimes unit investigations and done so with a guarantee that it will be free from political influence," Kerry told CNN after his talks with Karzai. Asked whether he believed Karzai's promise, Kerry told CNN, "In the end, the test will be what the government of Afghanistan does itself to assume those responsibilities. ... Let's just see over these next weeks that the actions speak louder than words." The anticipated announcement comes a day after Karzai confirmed on the ABC program "This Week" that he engineered the release of a security official arrested on suspicion of corruption. Karzai said he "intervened very strongly" in the case of Mohammad Zia Salehi because "this man was taken out of his house in the middle of the night by 30 Kalashnikov-toting masked men in the name of Afghan law enforcement." "This is exactly reminiscent of the days of the Soviet Union where people were taken away from their homes by armed people in the name of the state and thrown into obscure prisons in some sort of kangaroo courts," Karzai said. "It reminds the Afghan people of those days with immense fear." Meanwhile, Karzai made clear on Sunday that he wants private security contractors, such as the 26,000 personnel working under U.S. contracts, to either join Afghan security forces or get out. He announced a four-month deadline for the transition last week, prompting Pentagon officials to respond the timeline was too tight. 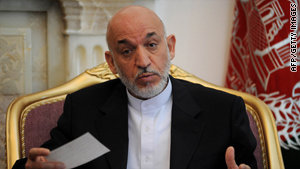 The security companies are involved in corruption, harassing civilians and, in some cases, working with terrorist groups on the side, Karzai said on ABC's This Week. "Their presence is preventing the growth and the development of the Afghan Security Forces, especially the police force because 40,000, 50,000 people are given more salaries than the Afghan police," he said of the private contractors. "Why would an Afghan young man come to the police if he can get a job in a security firm, have a lot of leeway and without any discipline? So naturally, our security forces will find it difficult to grow. In order for security forces to grow, these groups must be disbanded." In a direct appeal to U.S. taxpayers, Karzai said they should "not allow their hard-earned money to be wasted on groups that are not only providing lots of inconveniences to the Afghan people, but actually are ... in contract with Mafia-like groups and perhaps also funding militants and insurgents and terrorists through those firms." Both Kerry and Gen. David Petraeus, the commander of the U.S.-led military coalition in Afghanistan, have acknowledged problems existed with some contractors and said the United States should work with Karzai on the matter. "It's incumbent on us to help with this, to ensure that our money is not undermining our very efforts by ending up in the pockets of those who are not inclusive -- they are exclusive -- when it comes to the way that they're carrying out their activities in various communities," Petraeus said on the CBS program "Face the Nation." U.S. forces are scheduled to begin withdrawing from Afghanistan in August 2011 under a timetable set by President Barack Obama last December when he announced the deployment of an additional 30,000 troops there. While U.S. officials and military leaders stress the drawdown will be based on conditions on the ground, some Republicans have criticized Obama for announcing a date to begin reducing forces.